Fennel is a staple in my pantry during the winter and spring. It can be eaten or cooked in an seemingly endless variety of ways. The flavor is faintly reminiscent of anise or licorice. Bulbs should be firm and compact, with no shrinkage; fronds should be a vibrant, lively green. I often use it as part of a mirepoix or as a substitute for celery. If you page through this blog, you’ll see that I typically use it in salads, and occasionally in soups like minestrone. 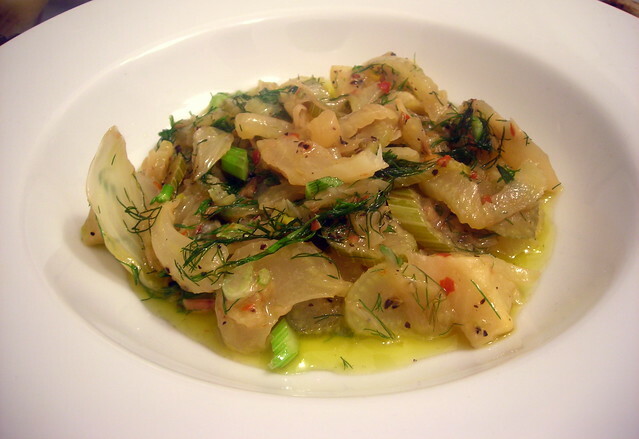 Then, there is fennel confit. Remember the carrot and cauliflower confit from a couple of days ago? Well, this is twice as delicious and just as easy. The name sounds fancy, but the truth of the matter is that the fennel is braised in a savory (and fattening) mixture of unsalted butter and olive oil, along with lemon, shallots, fennel seed and crushed red pepper flakes until it’s so soft, it’s literally falling apart. How does it taste, you ask? Well, it’s a little sweet, a little savory and quite lively. The confit liquid makes a killer salad vinaigrette base, but I have a feeling there are other untapped uses for it. I don’t know about you, but I look forward to brainstorming some ideas. This recipe is adapted from this blog post at The Kitchn. I subbed in shallots for the garlic, added a pinch of fennel seed, slightly increased the amount of olive oil, and reduced the amount of butter called for in the original recipe. This recipe is scaled down by half. Whichever version you happen to make, it’ll be delectable. It’s worth your time. Wash the fennel and lemon well. Chop the fennel stalks into 3-4 inch pieces. Chop about half the fronds into bite size pieces – reserve the other half for garnish. Cut the lemon into quarters and remove the seeds. Thinly slice the shallots. Melt the olive oil and butter in a heavy, flat-bottomed sauté pan over medium heat. Add the fennel, lemon, and shallots. Shake a little black pepper over top, and stir in the salt, fennel seed and red pepper flakes. Cover tightly and cook on low heat for about 45 minutes, or until soft and tender. Let cool. You can serve as is, or blend in a food processor until chunky. Stir in reserved fennel fronds and greens for garnish. Store in the fridge – this will keep for at least a week – probably up to two. 13 Mar	This entry was published on March 13, 2013 at 3:46 am. It’s filed under food, food photography, Gluten-Free, recipe, vegetarian, winter and tagged fennel, food photography, gluten-free, side dish, vegetarian, winter. Bookmark the permalink. Follow any comments here with the RSS feed for this post.